The IoT and analytics save time, money, energy, and resources. The value of IoT is its ability to monitor, control, and compile data. Data derived from IoT sensors when combined with analytics can lower operating costs, enable new business models, and improve productivity. Embedded sensors monitor, measure, and manage connected devices with limited human interaction. Less human interaction often translates into higher productivity. IoT sensor data and analytics reduce costs by conserving resources such as energy, water, and capital. Sensors that can monitor and control devices minimize maintenance costs by detecting anomalies and generating threshold alerts. Sensor data can optimize yield through effective resources allocation and process flow. Essentially, sensor data and analytics reduce costs, conserve resources, mitigate risks, and optimize yield. The IoT is comprised of connected devices, wireless sensors, and controllers that enable device control and data collection. Connect IoT sensors provide the network infrastructure to enable command and control of devices while allowing for data collection and processing. The economics driven by low cost cloud computing such as analytics and data management means small and mid-sized companies have low cost access to the IoT and the value it provides. 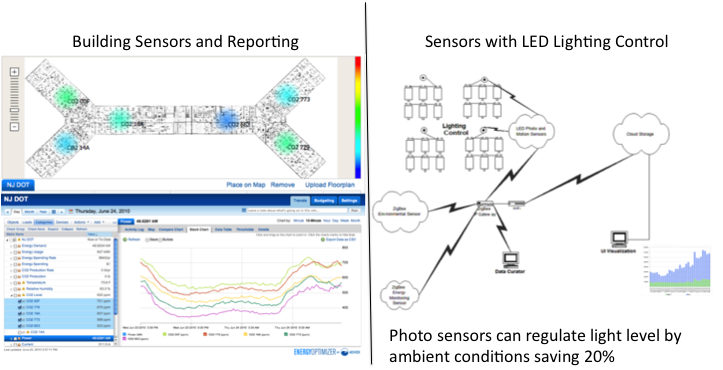 To illustrate how IoT and analytics provide resource conservation and cost reductions can be demonstrated by looking at sensor deployment in the built environment. For example, energy costs are reduced by using photo and occupancy sensors that can control lighting typically save 20% of a building’s lighting cost. On average, lighting accounts for 25% of the buildings energy costs or approximately $0.70 per square foot according to the DOE. When lighting controls sensors are connected to the Internet, they enable remote diagnostics, device control, and collect data. The value of sensor data can only be measured in the context of actionable insight. By analyzing data from IoT devices, new business models can be created. Analytics play a crucial role developing new business models. Uber uses analytics to know user demand by the minute. Palantir Technologies provides visual analysis using disparate transactional activities to detect fraud. IoT devices allow greater detail in data capture and faster timing responses. IoT sensors that enable device control and data capture will engender new business models. By measuring activities such as traffic flow in a retail mall including entry and exit points, dwell time, and traffic patterns, a better understanding of your customer is captured. The same can be achieved looking at personnel and process flow. IoT sensors can help preserve, protect, and maintain customers, personnel, assets and equipment. The IoT will also contribute to improving productivity. Productivity gains are often associated with reducing costs. One factor that helps improve productivity is associated with lowering transaction costs. Transaction costs involve monitoring, measuring, and managing business activities. Transaction costs were defined by Ronald Coase, the 1991 Nobel Prize laureate in Economics with “The Nature of the Firm,” published in 1937. IoT sensors with remote monitoring capabilities provide a new framework in managing, monitoring, measuring, and managing business processes with less human interaction. In addition, the IoT, Big Data and analytics create insight that often leads to innovation. By reducing transaction costs, advances in technology and innovation can translate into higher productivity. For instance, to facilitate exchange of goods and services, agreements and specifications as to weight, size, volume, ingredients, and performance need to be established. The verification and monitoring of these activities involve transaction costs. Minimizing activities associated with managing, monitoring, and measuring reduce transaction costs. In general, the more goods and services are automated and standardized, the lower the transaction costs. For example, world trade accelerated after the advent of containerized shipping. With the introduction of containerized shipping by Malcom McLean in Port Newark, NJ in 1956, standardization and uniformity streamlined processes in packaging, logistics, and operations. With less time, labor, and resources being applied to measuring and monitoring, transaction costs are lower, which in turn, translate into productivity gains and economic growth. With containerized shipping, shipment volume in the Port of New York and New Jersey increased nine-fold since the 1950’s while dockworker employment declined 93%. 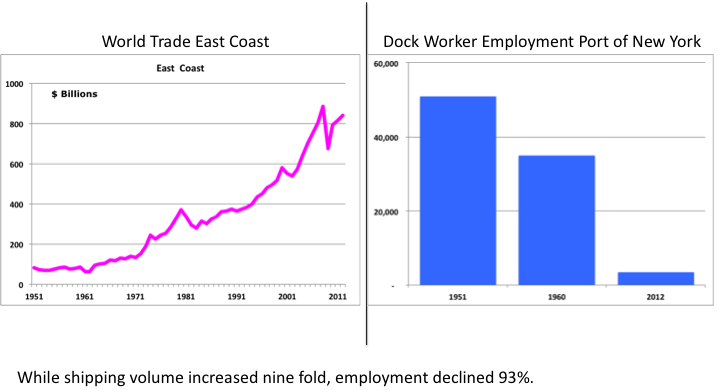 According to the Port Authority of NY & NJ, dock worker employment declined from over 50,000 in in 1951 to 3,500 in 2012 while shipments increased from $80 billion to over $830 billion. The catalyst for economic growth and productivity gains are often associated with reducing costs pertaining to exchanging goods and services. Shipping costs as a percent of trade value has declined since the introduction of containerized shipping. Just as containerized shipping reduced transaction costs for world trade, the IoT with connected sensors can reduce transaction costs. Productivity gains are usually accomplished by increasing outputs greater than inputs or reducing inputs at same level of outputs. Factors contributing to economic growth include technology, risk capital, available skilled labor, and energy. Often overlooked in economic growth and productivity are transaction costs. Transaction costs such as searching, monitoring, measuring, and managing can be reduced or eliminated with IoT connected sensors. The IoT provides a new paradigm in managing, monitoring, measuring, and controlling inputs and outputs. Economic data indicates containerized shipping contributed to improving productivity and world trade by lowering transaction costs; the Internet provides a similar approach. The IoT provides a new framework in managing, monitoring, measuring, and controlling inputs and outputs. Remotely connected sensors can facilitate the exchange of goods and services by reducing transaction costs by automating verification of weight, size, volume, tracking, and performance. In retrospect, the Internet has removed geography as a limitation for commerce. The Internet enables the ability to direct the messages and conduct the sales in the same transaction. The Internet was built on packetizing data similar to containerized shipping. A standardized approach to transporting data has reduced transaction costs associated with monitoring and managing data traffic. Internet search volume is up 400-fold since 1999. Data transport over the Internet virtually eliminates transaction costs associated with search. The ability to deliver content and conduct the transactions over the Internet substantially improves productivity. Analytics linked to measuring performance along the value chain can serve to optimize productivity and business value creation by focusing on business activities that contribute most to profitability. Therefore, steps to reduce transaction costs and tools that integrate business processes with analytics, act to drive performance by concentrating attention towards business activities that matter most to profits and productivity. There is often a lag between productivity gains and technology adoption. Implementing technology often requires new software, training, and redesign of business processes. An analysis of US economic activity and changes in productivity suggests technology may initially slow and/or impede productivity. As a consequence of anemic productivity growth, business profitability suffers. However, new tools and innovative approaches to business processes may offer substantial improvements to productivity through data analytics. The use of analytics enables businesses to measure, benchmark, and align processes to improve productivity while adapting to new technologies. The IoT, Big Data and analytics will profoundly change all facets of our lives. Just as the Internet was responsible for launching new businesses based on innovative models and processes, the IoT will drive economic activity and productivity by lowering transaction costs and generating innovation, and new business models.